Android O: From Developer Preview 1 to Google Pixel 2 in Under Six Months? As you might know, Android O, the successor to the Android Nougat mobile operating system from Alphabet’s Google was released to developers as a preview earlier this week. The new mobile OS for Android devices is currently available as Developer Preview 1 (DP 1) for Nexus and Pixel devices, and we’ve covered some of the key features in an earlier article, which you can review here. Android O is what we expect to see on the new Google Pixel 2 family of smartphones this year. A quick refresher: we saw better Bluetooth audio capability, picture-in-picture mode, better navigation on a physical keyboard, adaptive icons and background processing lockdown. For today, let’s look at the timeline for development, and when it will actually be ready for deployment on the Google Pixel 2, Google Pixel XL 2 and a third, much larger smartphone codenamed Taimen that are coming out during the third quarter of 2017. DP 1, or Developer Preview 1 is the initial release, and is in alpha right now. We saw some of the great features Android O will bring to our devices, but a lot of the functionality is yet to be included or enabled. From there on, it’s a monthly hop to the finish line. Mid-June will see Google finalize the APIs and the release of the official SDK, as well as Play publishing. That’s going to be DP 3. By this time, Google will have ironed out a lot of the bugs, added most of the features and made several improvements to Android O. 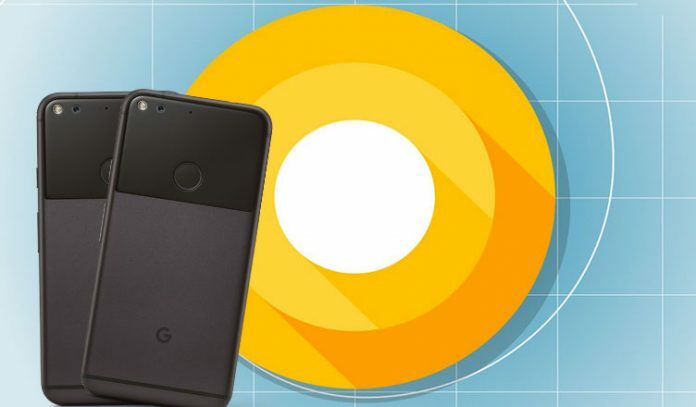 If everything goes according to plan, by the end of the third quarter, September, Google will be ready to release Android O to device manufacturers and add it to the Android Open Source Project. But wait, what about Google Pixel 2 and its two larger siblings? If what Google says is correct, then we could see their newest smartphones hit the market as early as September. Alphabet will definitely want that to happen, considering that’s the month iPhone Edition launches. We’re fairly certain Google wants to catch Apple on the hop and release Google Pixel 2 and Pixel XL (and possibly Taimen as well) before the new iPhone has a chance to gain sales traction. And that obviously means within a few days (or hours?) of its launch, but it could also imply that Google’s new phones will be ready for pre-order before Apple’s launch. That’s a big assumption, of course, but justified. Google obviously lost quite a bit of sales last year because it launched Google Pixel and Pixel XL almost a month after iPhone 7 and 7 Plus. We’re of the opinion that they will not hazard a repeat of that in 2017, when iPhone Edition is launched. As long as the development work on Android O can run on schedule, or even ahead of schedule, that’s still a possibility. And it makes sense from another perspective, too. If Google is saying that OEMs will get Android O in Q3, it’s almost implicit that Google Pixel 2 family will get it first. For now, our guesstimate is either a late August or early September launch, with pre-orders opening right away. That’s the only way they can go one better than Apple. Besides, if rumors are true and iPhone Edition only ships out in November, it will give Google a massive advantage over the Cupertino giant – another major pothole in Apple’s roadmap for this year’s flagship device.